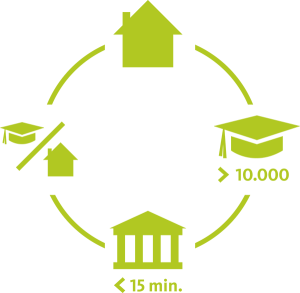 DREF – Deutsche Real Estate Funds™ invests in the future of education in Germany. Finally, Germany is becoming ever more popular as a place to study. The high quality of life, comparatively low tuition fees and above all the good career prospects after completing studies provide for a growing number of students at German institutions of higher education. This trend is giving rise to a substantial shortage in the supply of high-quality yet affordable accommodation. Against this background, we invest in existing student residences or properties which are suitable for conversion into such student accommodation. We assign a great deal of importance to the quality of a building’s structural fabric. At least 10,000 full-time students must be enrolled at the university of the town or city concerned. The accommodation ratio and the vacancy rate in a university city are to be below the nationwide average. The distance from the property to the university must not be more than 15 minutes by bicycle. Public transport has to be available in the direct vicinity.